The “Ben Bow” design was William Atkin’s own cruising boat–the yacht that the famed American designer created for himself and his family. 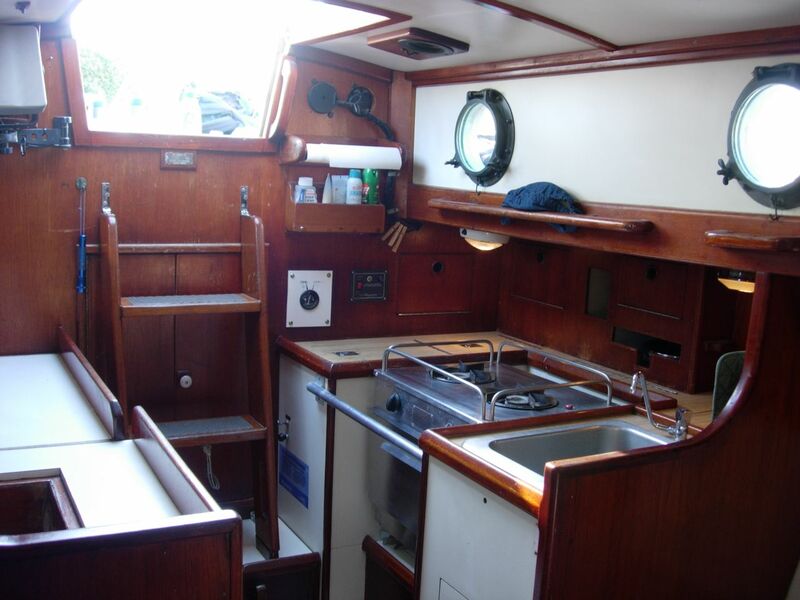 She is a beautiful little cruising boat that is just right in proportion and balance. What designer wouldn’t pay extra attention to detail on his personal craft? 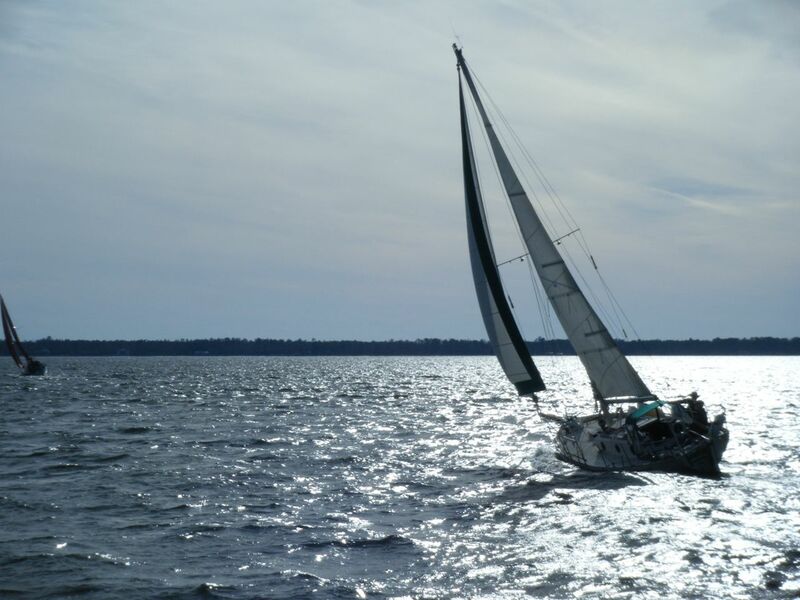 She sails well and with a good turn of speed; has a very kind motion in a seaway; is dry; strong; and has an inviting interior. 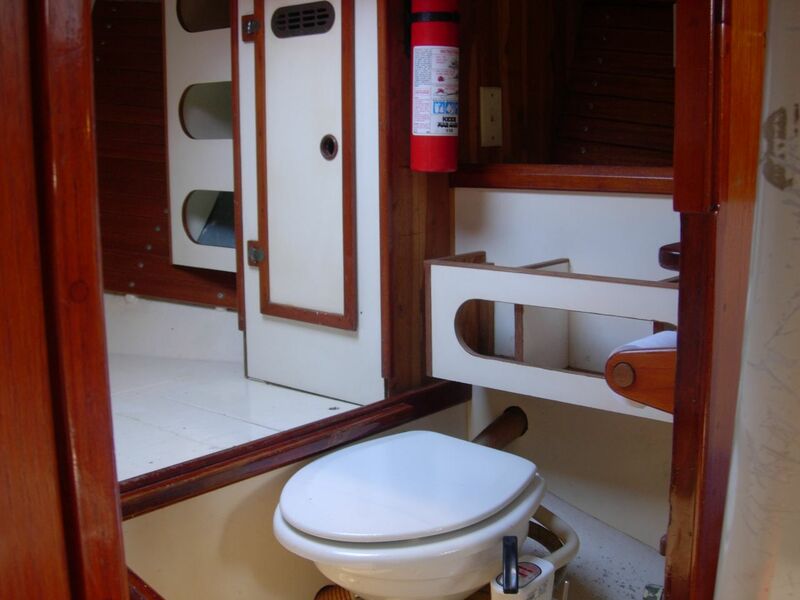 There is little else that one could ask of a good cruising boat. Sirocco is a William Atkin designed “Ben Bow” cutter that was professionally built in Airex-cored fiberglass by Keith Falstrom of Sarasota, FL, and first launched in 1981. Her build quality is first-rate, and only the best materials were used throughout. 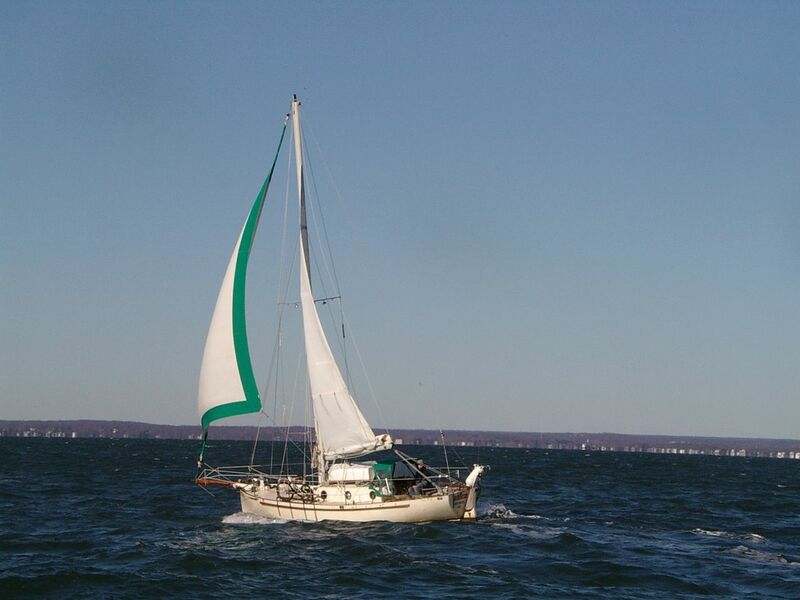 A slightly modernized version of a classic design, the hull is faithful to the “Ben Bow” lines, but carries a Marconi cutter rig with a bowsprit. This is a hybrid of the plans for the Marconi rig and the gaff rig, as designed by William Atkin. 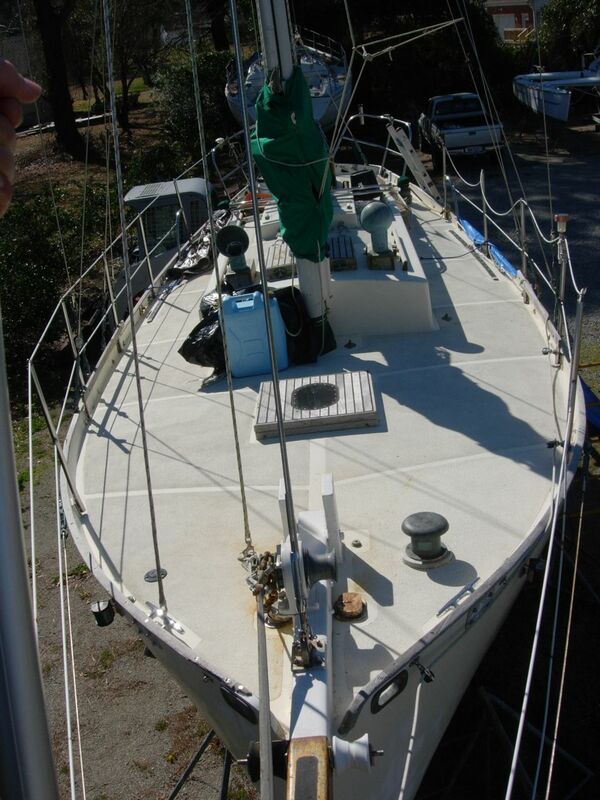 Only the gaff rig had a bowsprit in the original design. 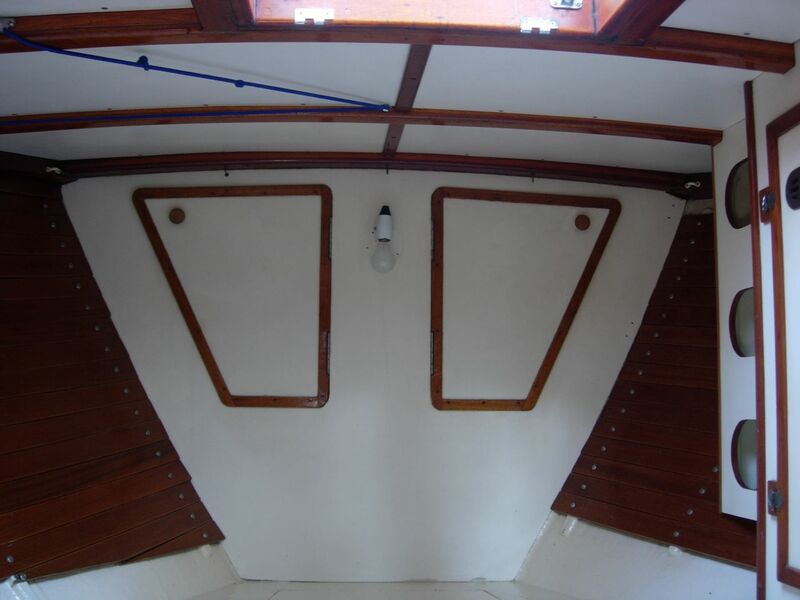 This modification gives Sirocco plenty of sail area while keeping the rig height modest. It also gives her a look very much like the popular Bristol Channel Cutter designed by Lyle Hess. 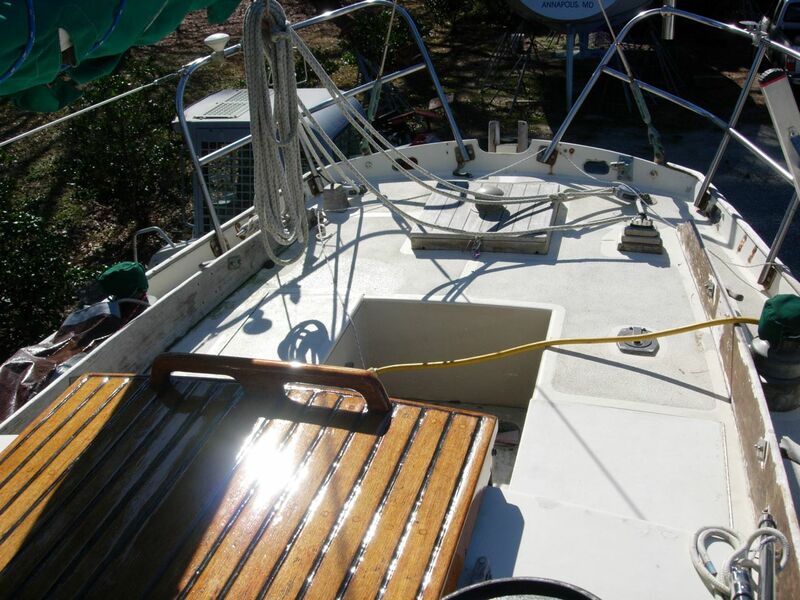 The deck is built on laminated beams and is sheathed in fiberglass and epoxy. 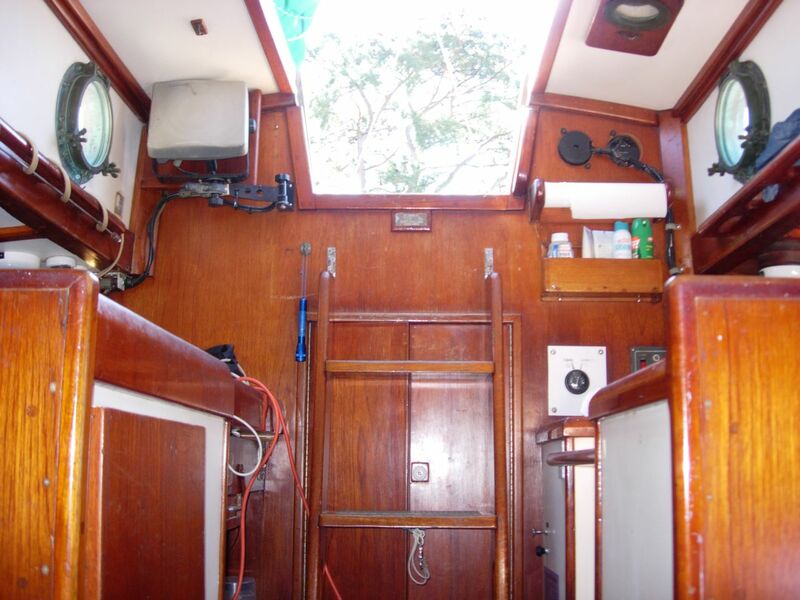 She has traditional finishing touches, including bronze portholes and cowl vents (set on teak dorade boxes); teak deck hatches; and teak cockpit coaming. 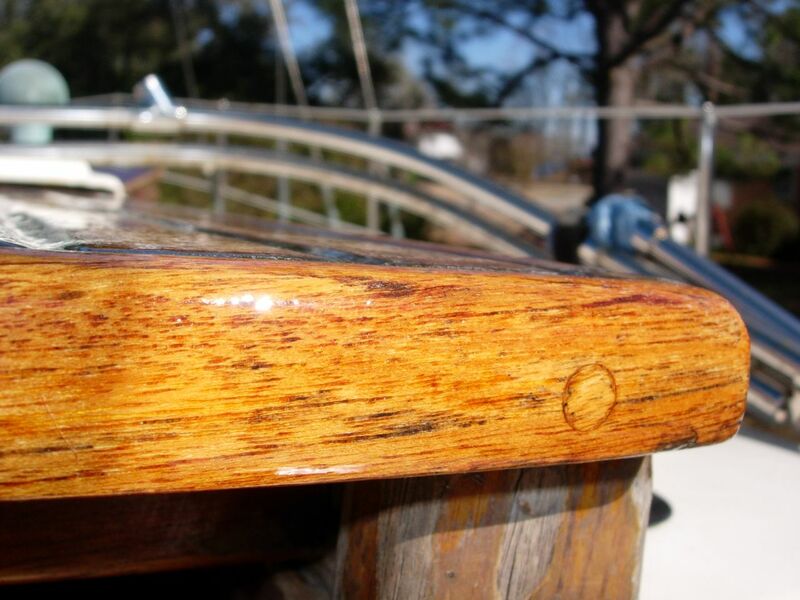 The heavily-built rudder is set on oversized bronze gudgeons and pintles. The underwater portion of the hull is barrier coated with epoxy. 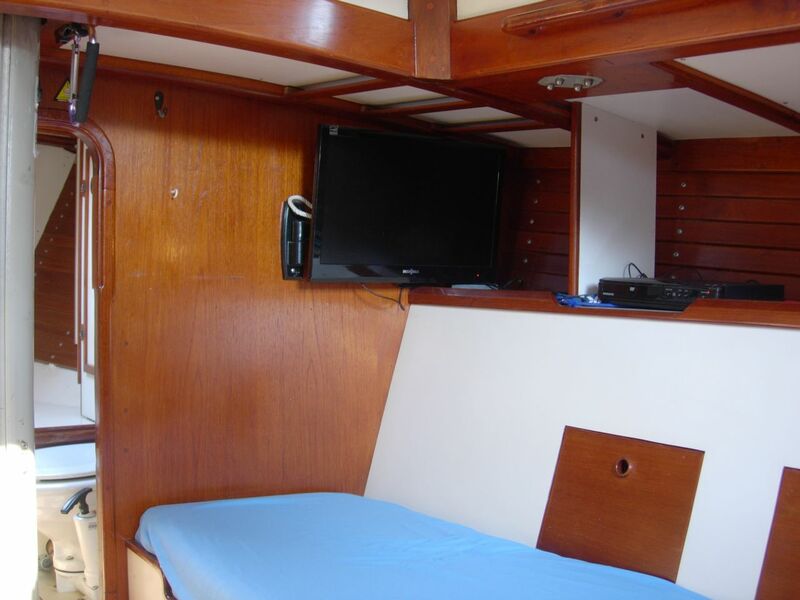 This is a solidly built, confidence-inspiring cruising boat. 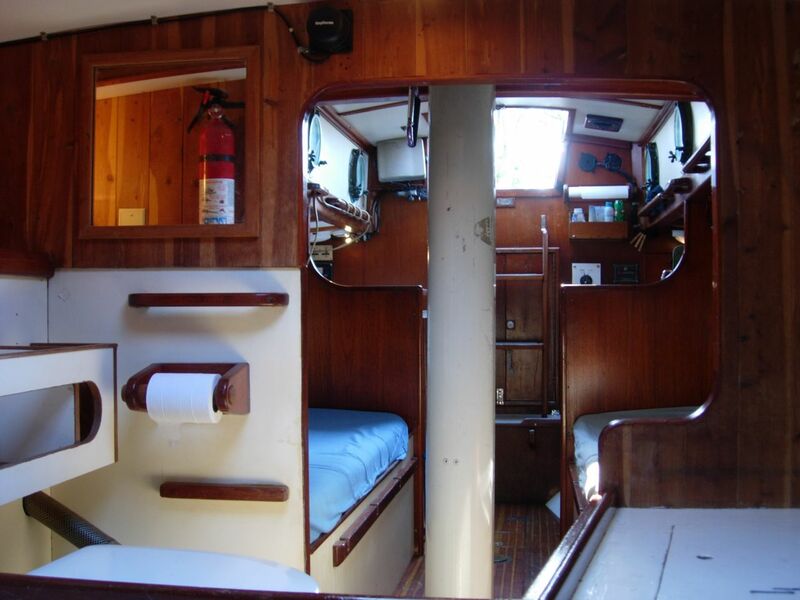 Down below the layout is very practical, offering good handholds, plenty of places to brace while at sea, an amazing amount of storage space, and good sea-berths. 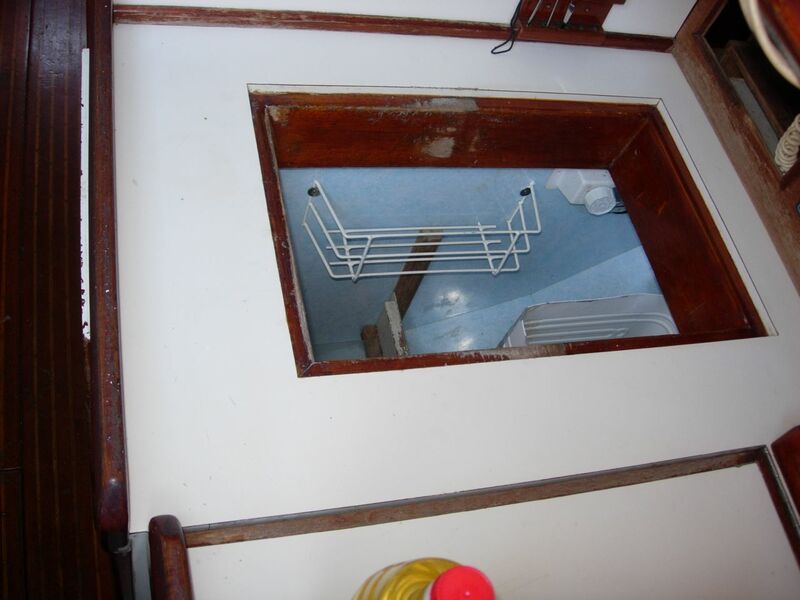 Access to the engine room is through doors beneath the companionway ladder. 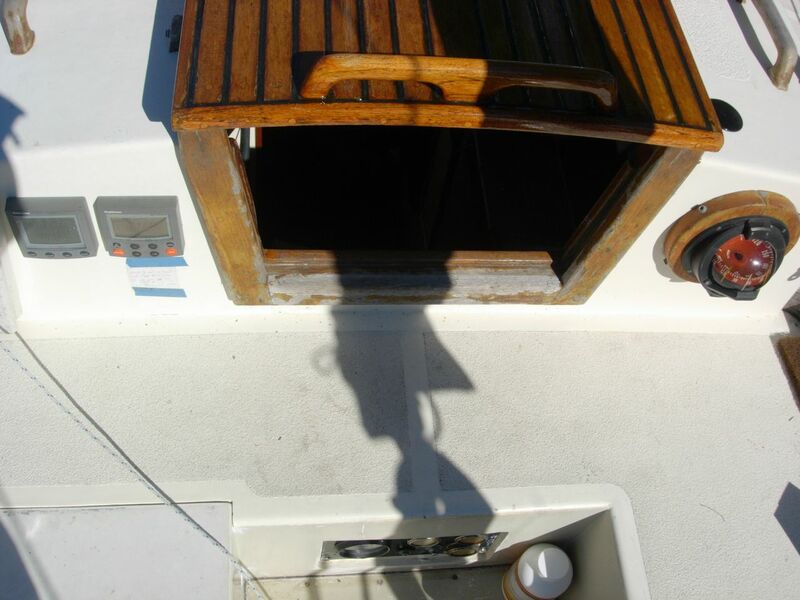 Immediately forward of the ladder is a full-sized chart table to starboard with the icebox below the forward portion. 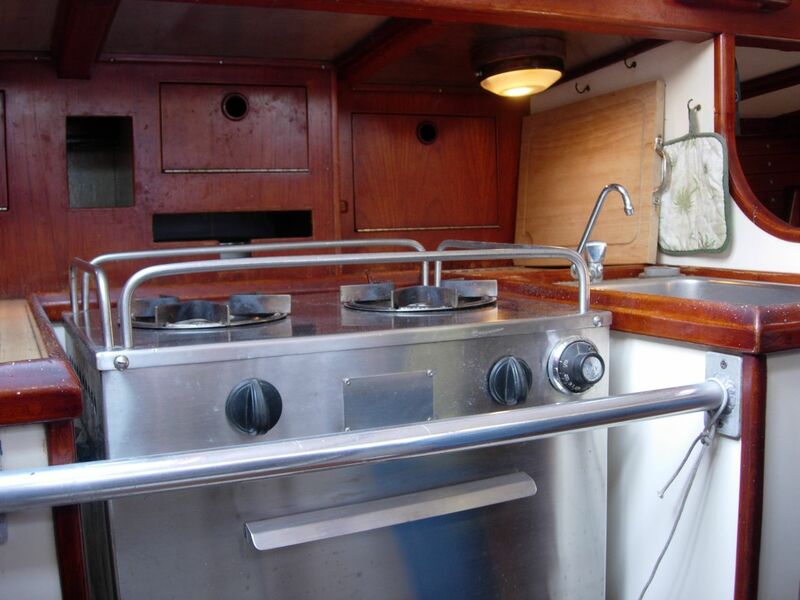 The galley is to port, and features a 2-burner stainless Shipmate stove with oven, and a nice, deep sink. 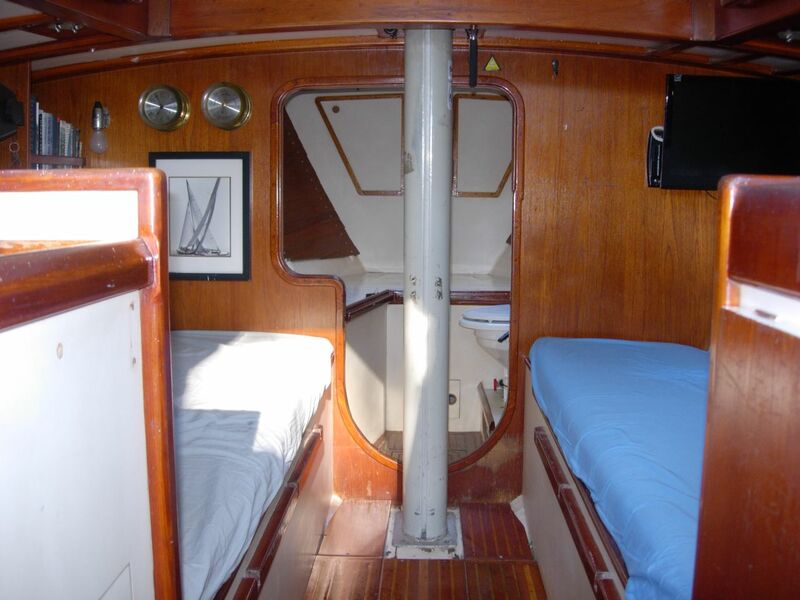 Forward of the galley, two settees face each other in the saloon, with storage in seat backs and outboard. The settees can be converted to a large double bed by adding a filler between them. Forward of the mast is the head and another berth to port, which can be converted to a double. 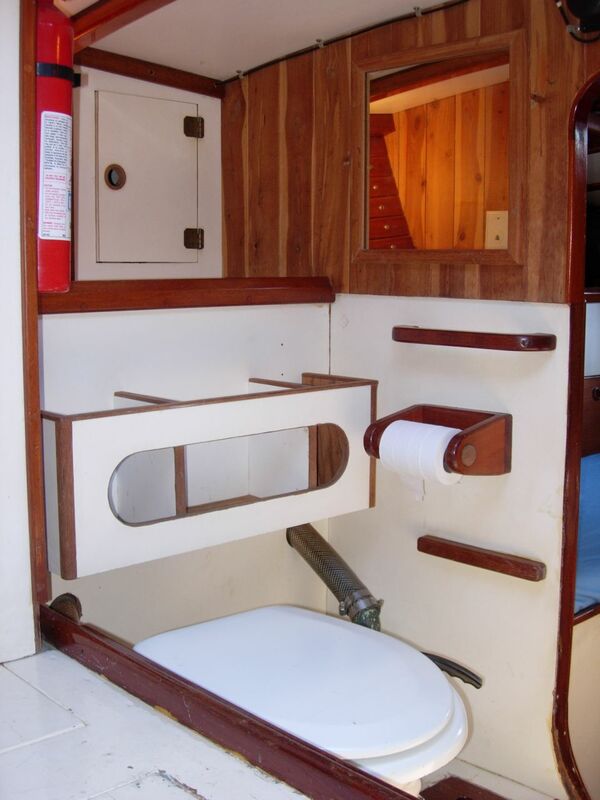 The head is to starboard, with additional storage. 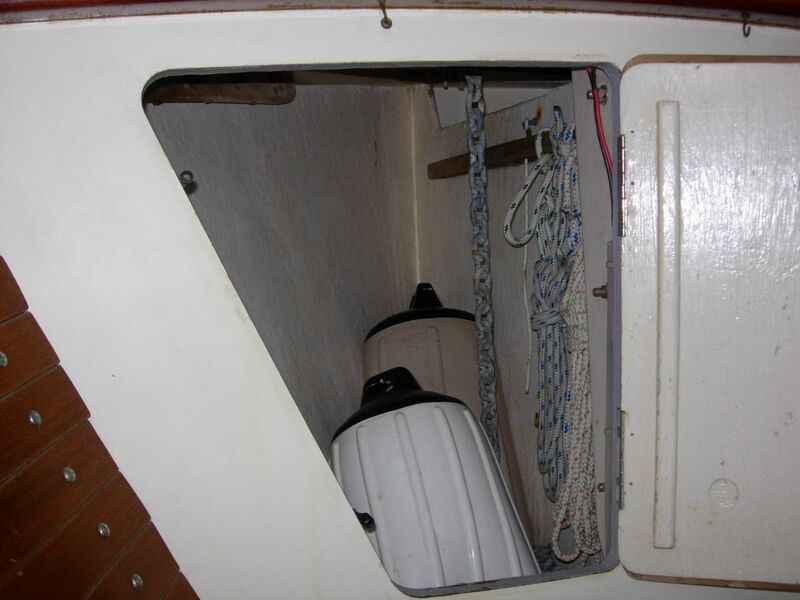 There is a spacious anchor locker and storage area in the very forward end of the ship with plenty of extra hanging room for spare lines, etc. 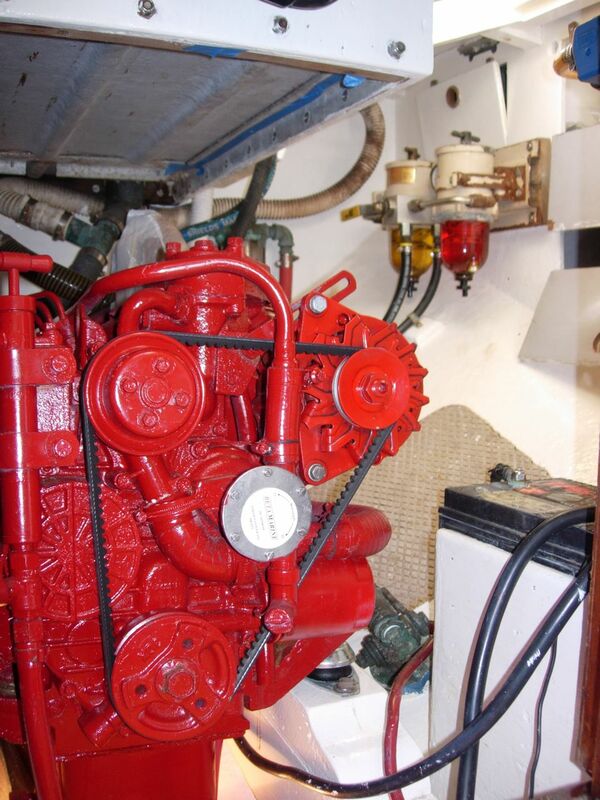 Auxiliary propulsion is provided by a 28-hp Beta Marine diesel engine driving a conventional 3-blade propeller. The engine has less than 2,000 hours as of early 2013. 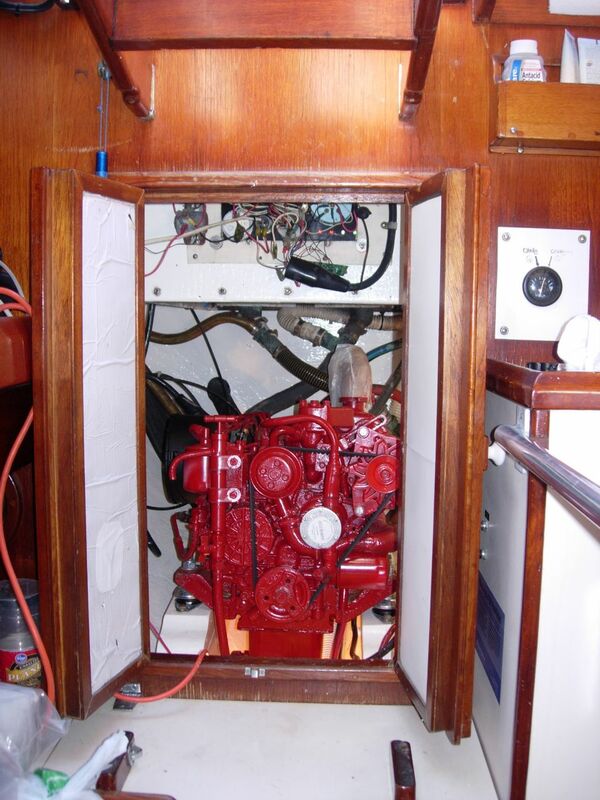 Recent improvements to the machinery include a new cutless bearing; new bronze stern gland with dripless packing; new shaft coupling; new flexible coupling; new engine mounts; and new ball joints and ends on the shift cables. The engine has a new alternator, raw water pump, and stop solenoid. Valve clearances were checked at 1950 hours and everything is within specifications. Systems are simple and easily accessed for maintenance. The well-insulated icebox has electric refrigeration. The galley faucet is supplied with pressure fresh water. 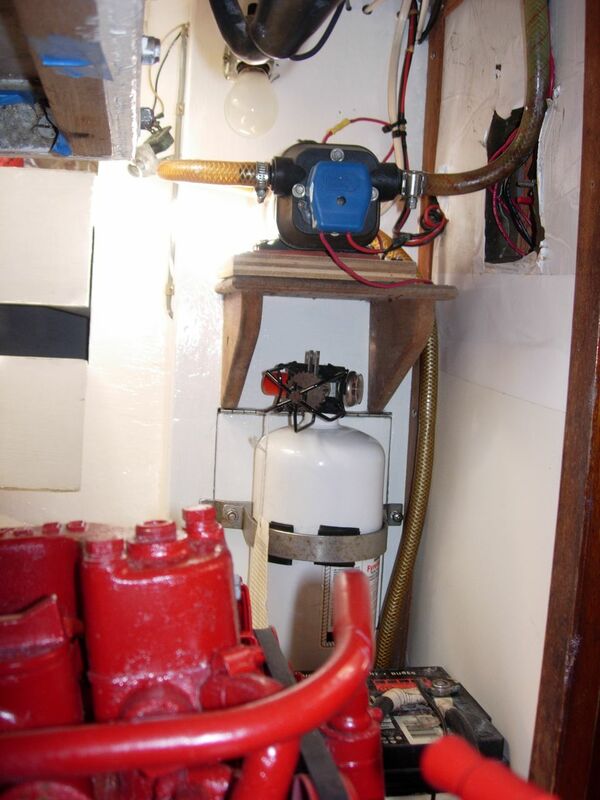 The manual head flushes to a 15-gallon holding tank, or directly overboard. 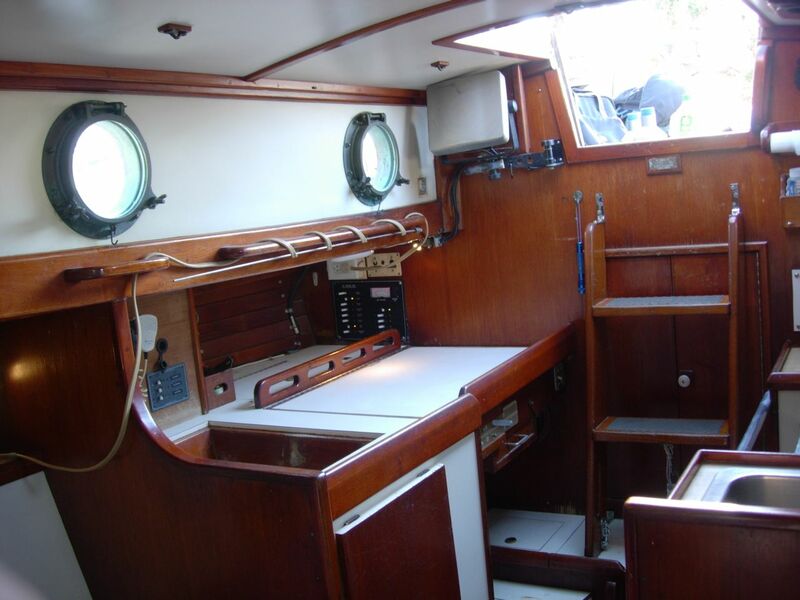 Electronics include a Standard Horizon VHF; Raytheon speed and depth sounder; Raymarine ST-4000+ autopilot with electric linear drive; and Garmin Oregon 400C GPS chartplotter. Additionally, there is a flat-panel LCD television; DVD player; and installed stereo system. 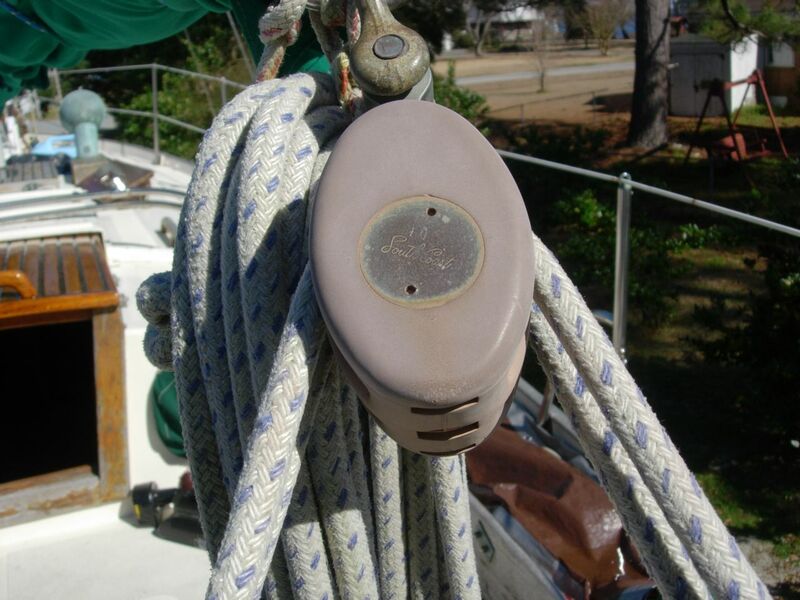 The masthead tri-color light and anchor light are LED, and the anchor light has a sensor for automatic operation. Ground tackle includes a 35-lb CQR anchor on 40′ of 3/8″ chain and 250′ of 3-strand nylon rode. 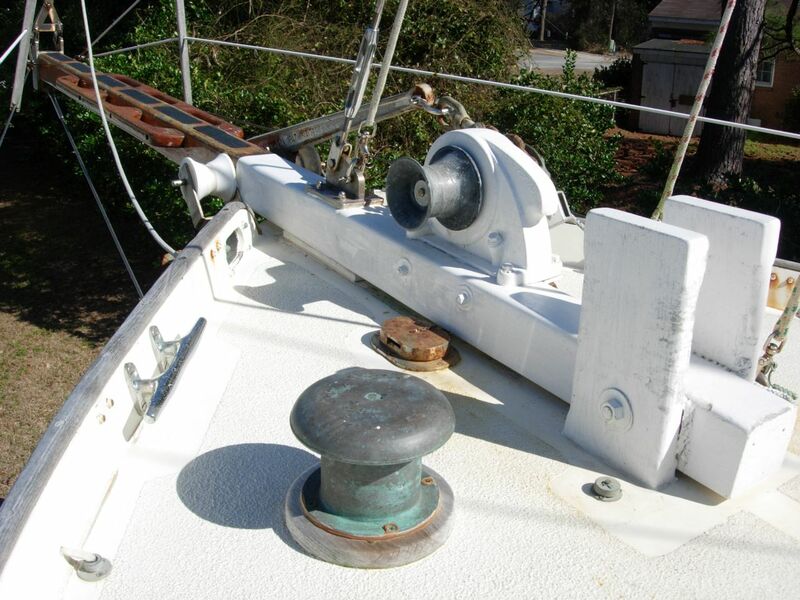 Anchor handling is assisted by the manual windlass. 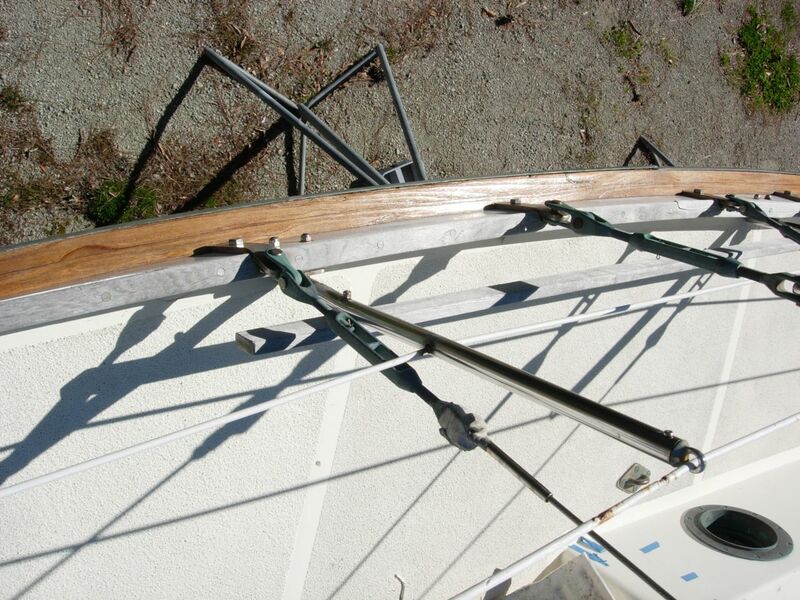 The spars are Kenyon aluminum extrusions painted with Imron polyurethane. 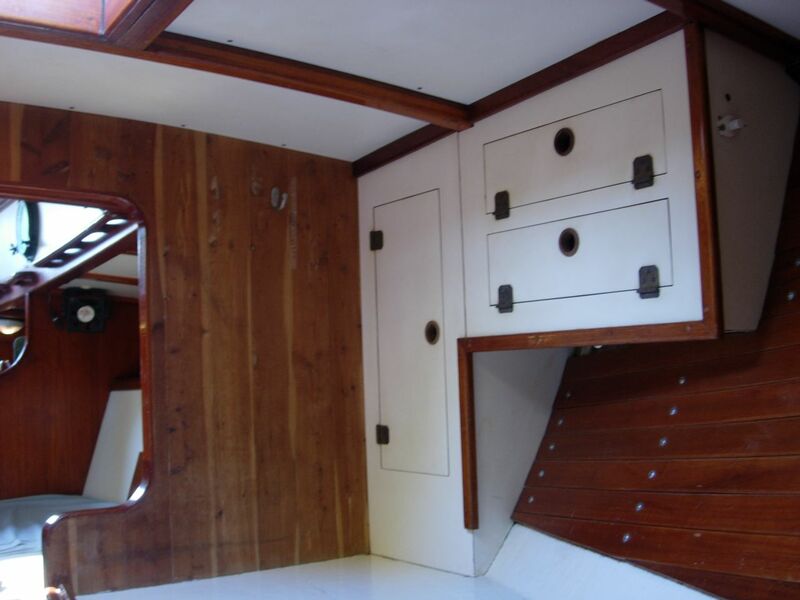 The main mast is stepped on a massive support at the level of the cabin sole. 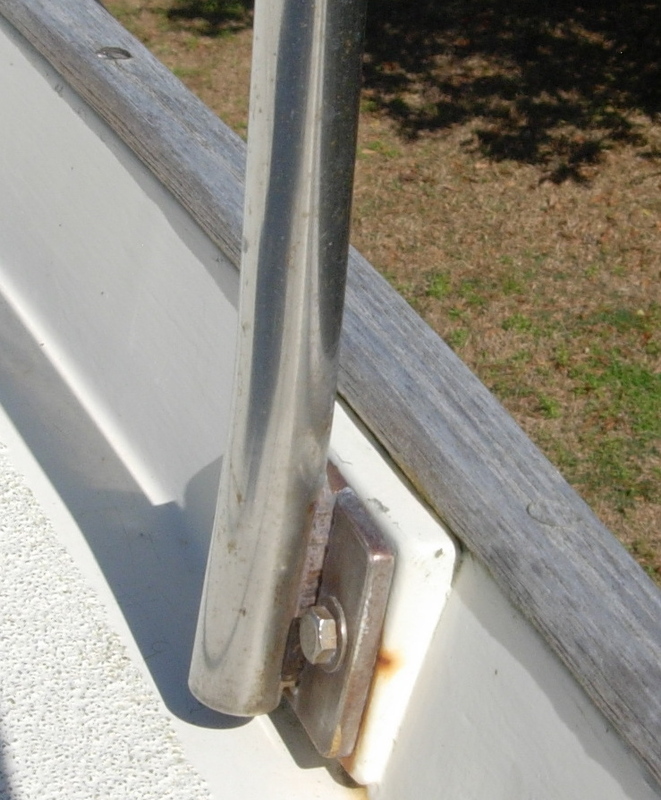 This keeps the heel of the mast out of any potential bilge water, preventing corrosion problems. There are two deep reef points in the main sail. 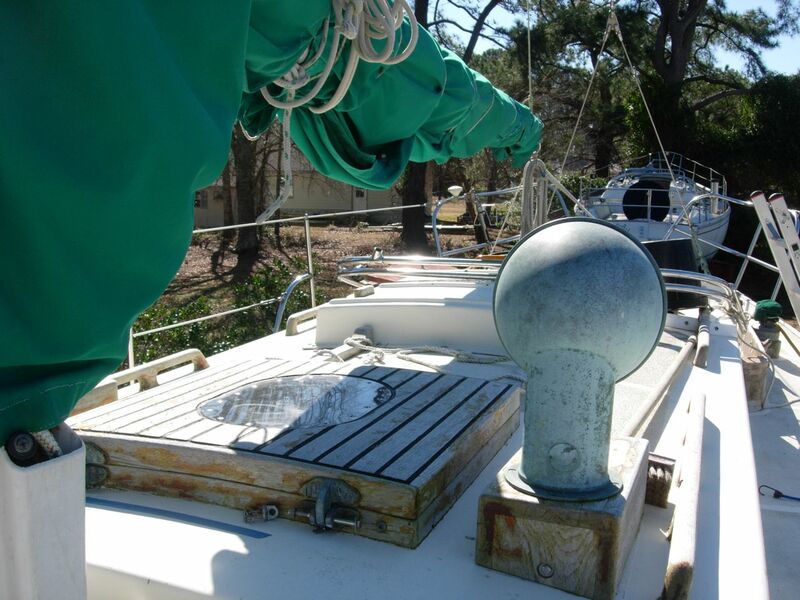 The yankee is roller furling, set on a Profurl roller furling unit that can also be used for reefing. 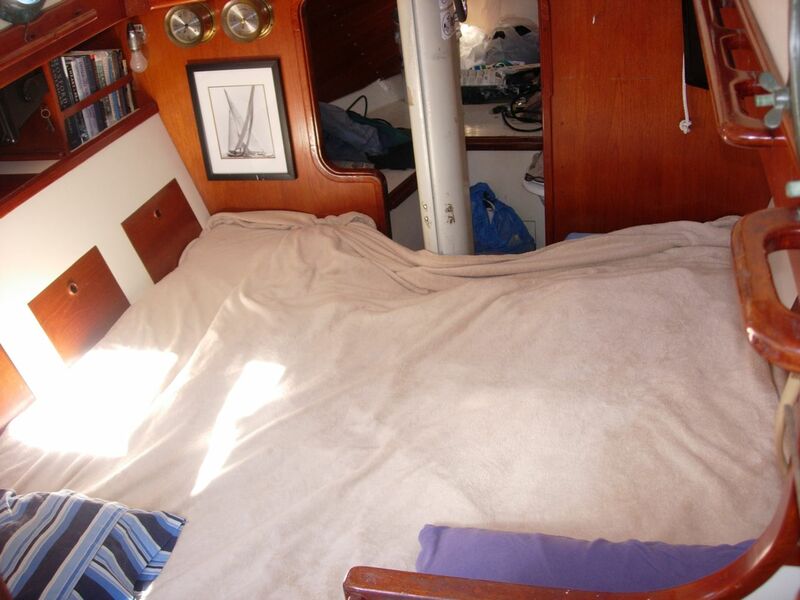 The staysail is hanked on to the inner forestay and has a storage bag. Sirocco carries a 7-foot Eli Laminates rowing dinghy that fits on the cabin top. This dinghy has been reinforced with extra layers of fiberglass and epoxy on the chines to take the abuse of being hauled up beaches, etc. The video below shows her underway in perfect conditions one hundred miles off the coast of South Carolina. The three following videos show the interior of Sirocco. 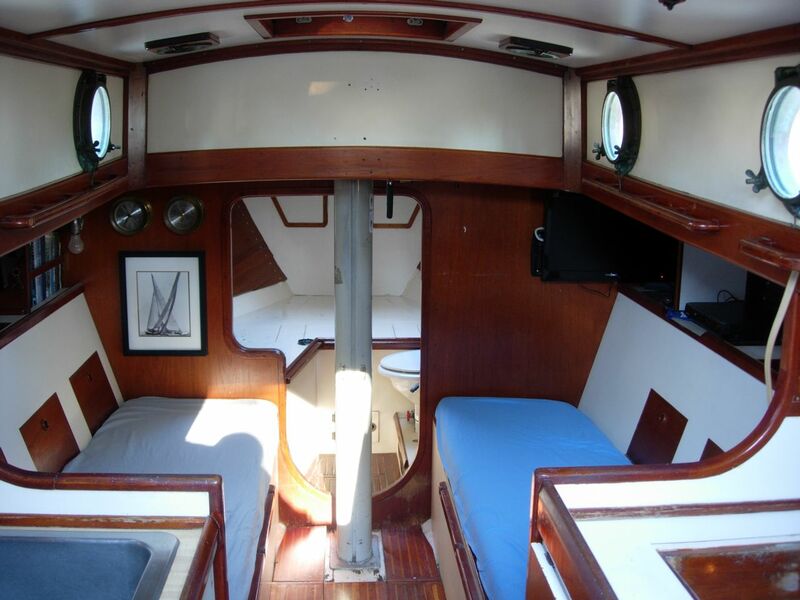 There is a separate, short segment for the forward cabin and head; main cabin and galley; and the engine room. 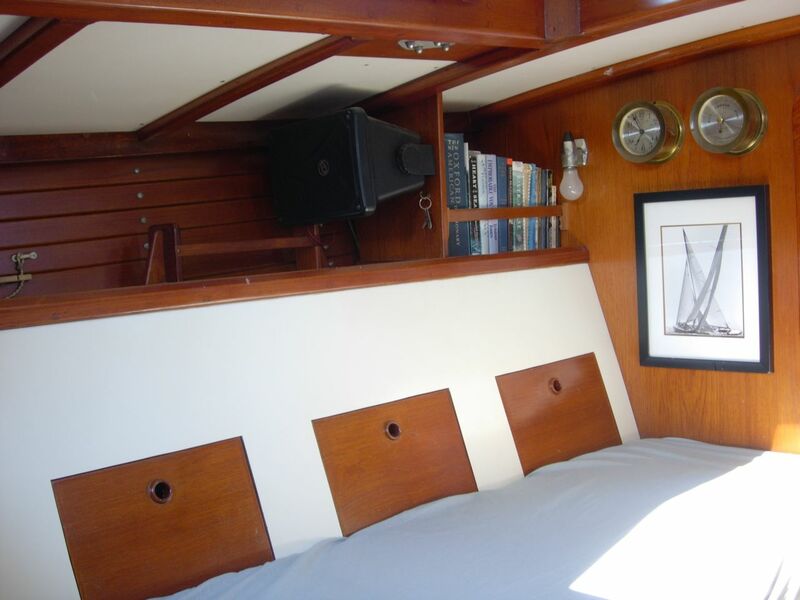 For more views on deck and in the cabin of Sirocco there is a large gallery of new pictures below. We were just in Urbanna. I saw her as we crossed the bridge and stopped to take a look at her. We may be very interested. She seems to be a beautiful boat. We need to know the Headroom. 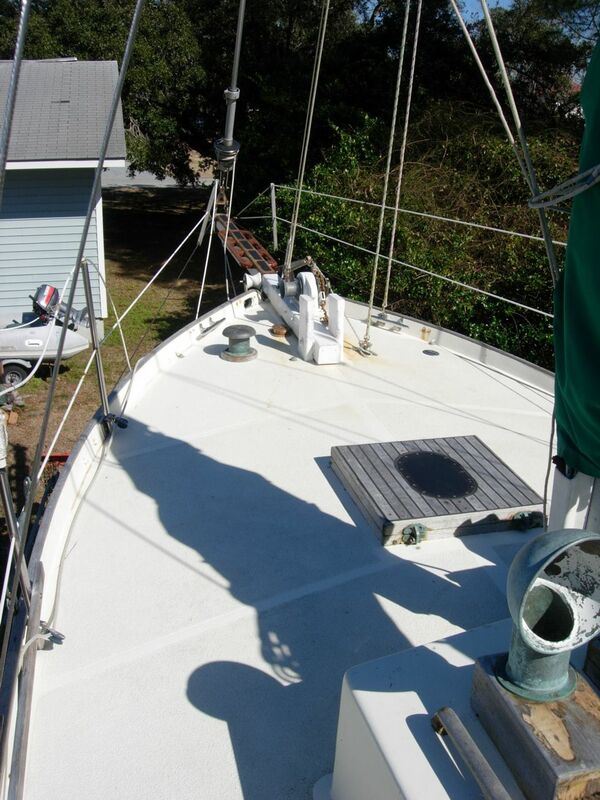 Also we would like to know if there’s anything that needs to be done before she can sail. We live in Fredericksburg and can get down there to see her when you are available. I’m interested. Are you in Oriental now? Hi John, I will be in Oriental all this weekend. Please feel free to stop by at your leisure. Thanks for sharing the video. Sirocco looks like a beautiful boat.